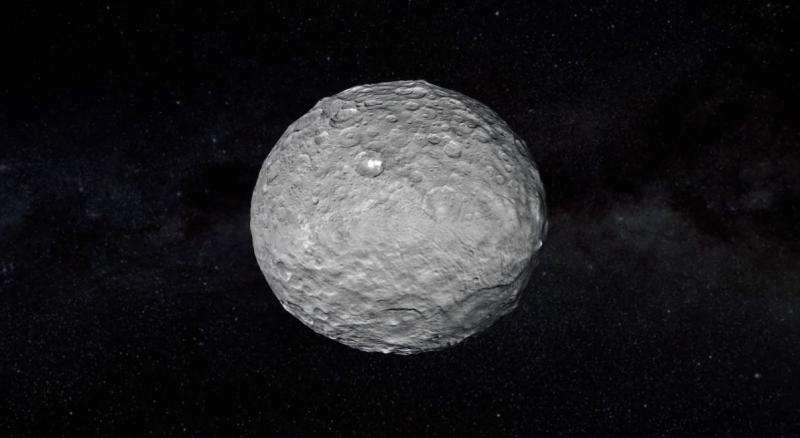 The dwarf planet Ceres is the largest object in the asteroid belt between Mars and Jupiter. It’s also one of the most interesting cosmic bodies in the area, with studies showing it may have water-vapor plumes and even a subsurface ocean. Now, new research shows that the dwarf planet’s geology is even more fascinating than meets the eye. Apparently, volcanoes have been erupting on the surface of Ceres for the past billion years. But these aren’t your typical volcanoes — instead of explosively spewing lava, they gently ooze ice! Ceres, which stretches only 965 km (600 miles) across, was first spotted on Jan. 1, 1801 by Sicilian astronomer Giuseppe Piazzi. At first, Ceres was called a planet, but as more asteroid belt members were discovered, the cosmic object was demoted to an asteroid status. Its status changed again in 2006 when it was promoted to a dwarf planet — a classification it shares with Pluto. In 2015, NASA’s Dawn mission discovered a huge volcano on the surface of Ceres. Called Ahuna Mons, the volcano measures 19 km (12 miles) at its base and stands 4.8 km (3 miles) tall. All its features suggested that Ahuna Mons was a young volcano, no older than 200 million years. This was downright perplexing to scientists, seeing how Ceres is geologically dead. Volcanic activity in the inner solar system generally wanes over time as the interior of a body cools, as is the case on Venus, Mars, and Earth’s moon. Why would a 4.5-billion-year-old Ceres suddenly become volcanically active? Ahuna Mons, of course, is not your typical volcano. It’s what scientists call a cryovolcano — a volcano that erupts icy material instead of molten lava. Cryovolcanism can be spotted elsewhere on the moons Enceladus, Europa, and Triton, and perhaps on many other worlds in the outer solar system. These eruptions are likely powered by the bodies’ internal heat and make for some of the best places to search for life beyond Earth because they expel material buried from potentially life-friendly reservoirs below the surface. Now, a team of researchers led by Michael Sori of the University of Arizona found that Ahuna Mons is not alone. By studying topographic maps captured by Dawn, the researchers found 32 large domes measuring more than 6.2 miles in diameter, which they suspected may be volcanoes. They eventually settled on 22 domes that suggest cryovolcanic activity, all of them estimated to be less than a billion years old. Ceres. Credit: NASA/Jet Propulsion Laboratory. 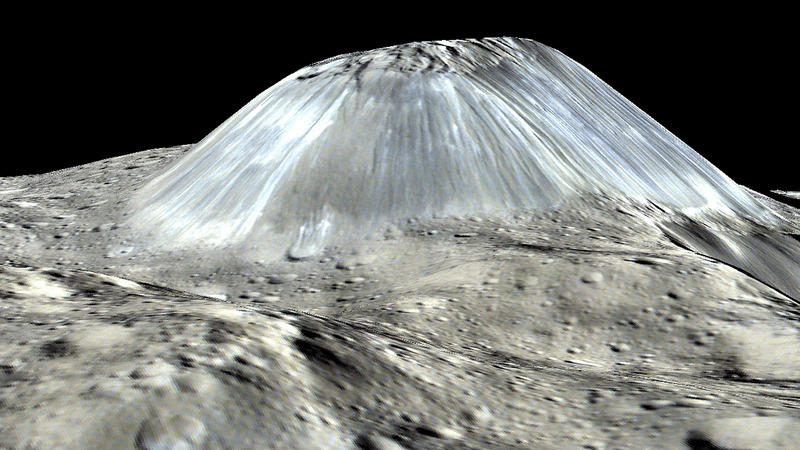 According to the researchers, it’s likely that Ceres has grown a new cryovolcano every 50 million years, on average. These findings help to explain some of the dwarf planet’s puzzling features, showing, for instance, that Ahuna Mons is not the only cryovolcanic construct on Ceres but rather one of many. The results also suggest that although Ceres has been continually cryovolcanic for the past billion years, the amount of eruptive activity is actually but a fraction of what geologists typically see on Earth (100,000 times less volume), much less even than has occurred on Mars and Venus. In addition to being less productive, the volcanic eruptions on Ceres are also much tamer than those on Earth. Instead of violent eruptions of ash, plume, and lava, cryovolcanoes simply ooze out cryomagma — a salty mix of rocks, ice, and other volatiles such as ammonia — which freezes on the surface. The causes themselves of cryovolcanic eruptions on Ceres are still a mystery but future research could come up with an explanation as more probes visit other bodies in the solar system. Scientific reference: Cryovolcanic rates on Ceres revealed by topography, Nature Astronomy (2018). DOI: 10.1038/s41550-018-0574-1.